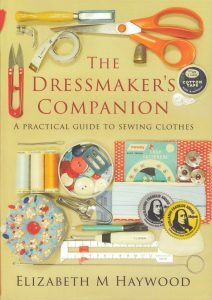 It’s only 4 days until The Dressmaker’s Companion is unleashed on the world, and one week until the book launch at Clare Library. I’ve been busy writing a speech and digging around in the shed for photos to make a power point presentation. I discovered that from a twenty year career, I have less than half a dozen photos of me at work. Surprising considering I spent so much time there, but I didn’t own a camera until I was 23 or 24, and when a person goes to work, it’s to work not take photos. Taking snaps of a fashion place tends to be looked on with suspicion, too. Nevertheless, I think I’ve got enough piccys to make a reasonable show. 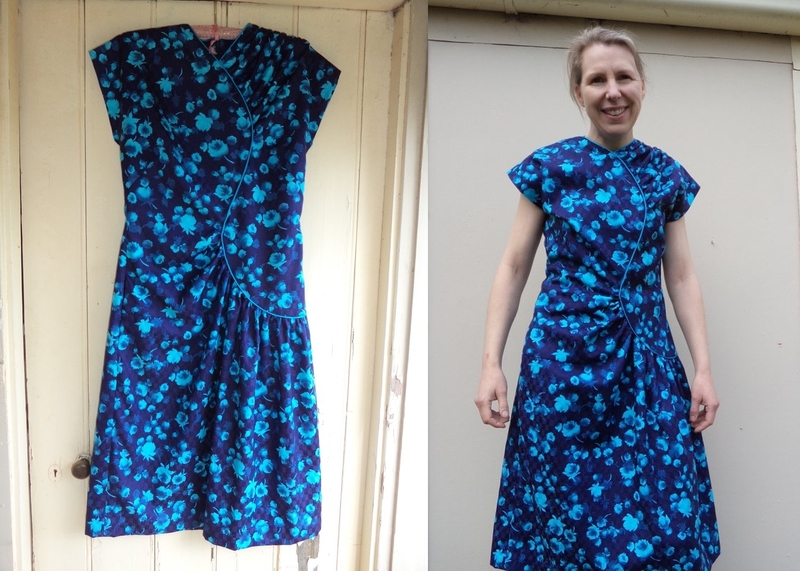 Have been working on this blue dress to wear for the book launch, but I’m not entirely happy with it. It’s not the dress’s fault – it fits perfectly and is sewn neatly. It looks better on the hanger than on, and I think it’s the neckline. It’s not often I misjudge a garment but perhaps I was enticed by the interesting cut and the opportunity to use some lovely old fabric. Husband thinks it looks like a Chinese dress. 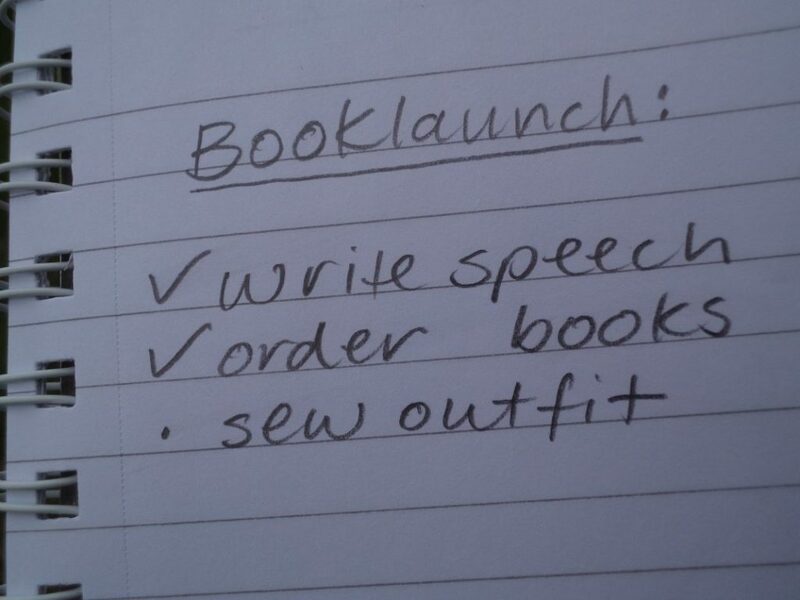 Good job there’s a backup plan; I’ll finish the green cord skirt and tie bow blouse. Why am I fixated with having to wear something new? It’s not like I’m lacking clothes! If you’re planning to attend the launch on the 5th and haven’t phoned the library to book, the number is 8842 3817. Otherwise I’ll provide a full report next week! We’ll be cheering from afar Liz. Hope it goes well!!! Hello Liz, great the book is nearly ‘out’. I was admiring your photo and quietly thinking, hmm, somethings up with the neckline when I read further to see that you thought the same thing. It’s totally the neckline! But everything else is lovely, great colour, great fabric, suits you so well. My vote is fix the neck and wear something new and blue. That neckline! The piping complicates it, but before I unpick I’m going to try a bobbly necklace (in aqua?) or something similar. 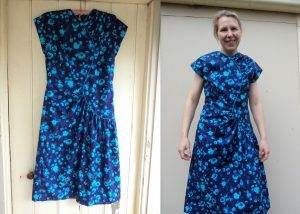 The dress needs to be a tighter fit..you Have a great figure…take the dress in and the neckline should work better too. Maybe shorter would help..
Good thoughts, Rosey. What I really need for this dress is an hour glass figure! (I’m a “column”) I think there’s no escaping lowering the neckline, and then I’ll review the dress’s tightness as you suggest. Cheers!